In the past few years Filsinger Games has partnered with indie wrestling companies throughout the United States. Now Filsinger Games branches into the New England wrestling scene for the first time with an exciting new partnership with Beyond Wrestling! Beyond Wrestling started in 2009 and for a while was known as the wrestling company with no fans. Wrestlers would showcase their talents in front of the other wrestlers and matches would broadcast on Beyond Wrestling’s popular YouTube channel. In recent years, Beyond Wrestling has expanded and now regularly packs buildings with enthusiastic fans. 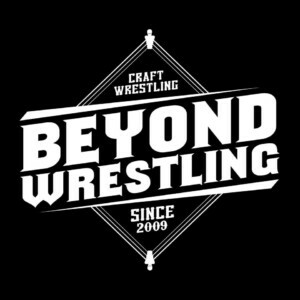 Beyond Wrestling still has a heavy focus on its YouTube channel which has the biggest following in U.S. indie wrestling due to its free weekly matches. What a deal! Check out Beyond Wrestling to see wrestlers you already love and new wrestlers that will be part of the new game edition. Beyond Wrestling will also be part of the WWN Live More Than Mania Experience in Orlando on March 20 – April 2, along with Evolve Wrestling, Shimmer and Chikara. Get ready— Beyond Wrestling’s card pack will be released late February!